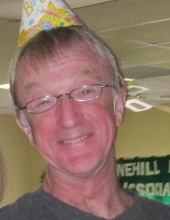 David P. Caffelle, 68, of Raynham, passed away Friday, April 12, 2019 at St. Elizabeth Medical Center after a lengthy illness. He was the husband of Dianne M. (Albanese) Caffelle. Born March 13, 1951 in Brockton, he was the son of the late William Charles Caffelle, Jr. and Ruth (Pearce) Caffelle. Raised in Brockton he graduated from Brockton High School and Massasoit Community College. David worked as a Custodian for the Taunton Public Schools for several years. He enjoyed camping, photography and especially spending time with his grandchildren. He has been a Raynham resident since 1982. He is survived by his wife, Dianne (Albanese) Caffelle; his daughters, Christina Caffelle and her fiancé, Richard Leavitt and Leanne Almeida; his grandchildren, Emelia, Sydney and Julian; his brothers, William Caffelle, Robert Caffelle, Donald Caffelle and Stephen Caffelle; he is also survived by many nieces and nephews. A funeral service will be held in the Russell & Pica Funeral Home, 441 South Main St., (Rt28) West Bridgewater on Friday, April 19th at 11:00AM. Calling hours in the Funeral Home on Thursday from 4:00-8:00PM. "Email Address" would like to share the life celebration of David Caffelle. Click on the "link" to go to share a favorite memory or leave a condolence message for the family.